KANSAS CITY, Mo. (AP) — Nate Orchard has gone from a highly drafted pick of the Cleveland Browns to a featured star on HBO’s documentary series “Hard Knocks” to the couch as an unemployed linebacker in the NFL. Now, he’s suiting up for a team with Super Bowl aspirations. Maybe even the Super Bowl favorites. Orchard signed with the Kansas City Chiefs on Wednesday to shore up their pass rush besieged by injuries. Justin Houston could miss several weeks after hurting his hamstring in last Sunday’s win over Jacksonville while Dee Ford and Tanoh Kpassagnon have been dealing with nagging injuries. The Chiefs (5-0) have become the trendy pick to win the AFC after routing the Jaguars last week, and they can validate those hopes with a win Sunday in New England. But winning on the road against Tom Brady and Co. became a lot tougher after the Chiefs’ defense sustained a surfeit of injuries last week. Along with their ailing linebackers, the Chiefs had to put right guard Laurent Duvernay-Tardif on the disabled list with a broken bone in his leg and Armani Watts on the IR with a core muscle injury. The Chiefs signed Frank Zombo, who had spent the past five seasons with Kansas City, when they made those roster moves on Tuesday. They added Orchard to further bolster their depth. The secondary is in a similar state of shambles. Strong safety Eric Berry remains sidelined with a heel injury that was supposed to keep him out a short period, but has instead sidelined him since early in camp. Daniel Sorensen remains on IR with his broken leg, though he could return in the next few weeks, and Watts has joined him on the list. Their backup, Eric Murray, was held out of practice Wednesday with a lower-leg injury. 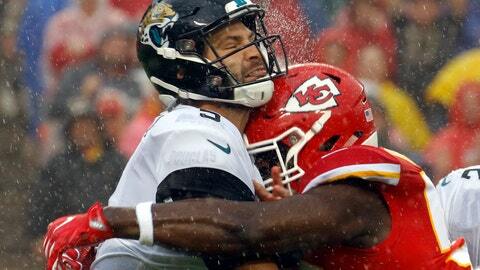 The Chiefs thought Watts had merely sustained a groin injury against the Jaguars, but trainer Rick Burkholder said an MRI revealed more damage. Watts was headed to Philadelphia for core muscle surgery on Thursday, though he should be ready for the start of practices next season. The fact that Chiefs general manager Brett Veach chose to add pass rushers in Orchard and Zombo and not an extra safety means they likely believe Berry and Sorensen will be able to help soon. Jordan Lucas, who arrived in a trade with Miami just before the season, picked off his first career pass after entering the game against Jacksonville. He’s in line to get more snaps alongside Ron Parker, and journeyman safety Josh Shaw could factor into the mix. That goes for all levels of the defense, including outside linebacker, where Houston’s injury and the uncertain status of Kpassagnon could mean a crucial opportunity for Breeland Speaks. The Chiefs’ second-round pick has been active for all five games, but he has mostly been used on special teams and to give the starters a breather. Now, the former Ole Miss star could be counted upon to put some pressure on Brady and cover the Patriots‘ pass-catching running backs. As battered as the Chiefs defense is right now, he’d better learn in a hurry.